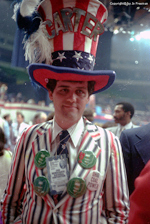 The 1980 Democratic Convention met at New York's Madison Square Garden from August 11 through 14, 1980. 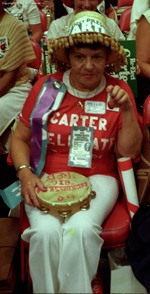 It was a contentious convention, marked by conflict between incumbent Jimmy Carter and challenger Edward Kennedy in addition to conflicts between feminists and the Carter campaign (another article by Jo Freeman). 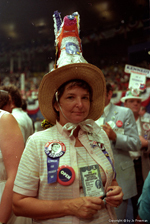 The Senator from Massachusetts had lost in the primaries and the caucuses but brought his challenge into the convention with fights over the proposed Rules and the Platform. When he lost on the first Rules fight on Monday, he announced that his name would not be put into nomination on Wednesday. 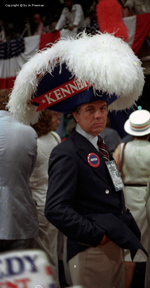 Nonetheless, Kennedy still received over one-third of the delegate votes before Carter was nominated by acclimation. Cong. 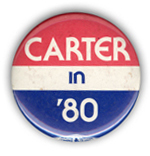 Ron Dellums (CA) was the only other person nominated in addition to President Carter. He got 2.5 delegate votes. 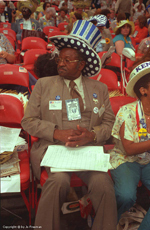 Instead of the usual celebration, Tuesday and Wednesday nights were consumed with debates over fifteen minority reports to the Platform and two more minority reports to the Rules. 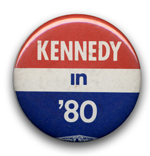 In the end, Carter won the nomination and Kennedy won the Platform.